We are officially into the Fall 2013 semester of class. This post is to recap all the things that are going on around NYC and Pace for you to enjoy before classes get serious. First off, it’s Broadway Week for anyone interested in seeing some excellent performances. Broadway Week means all shows are doing a 2 for 1 ticket deal, but it only lasts until the end of the week! Seats are disappearing fast, so grab some before they’re gone! 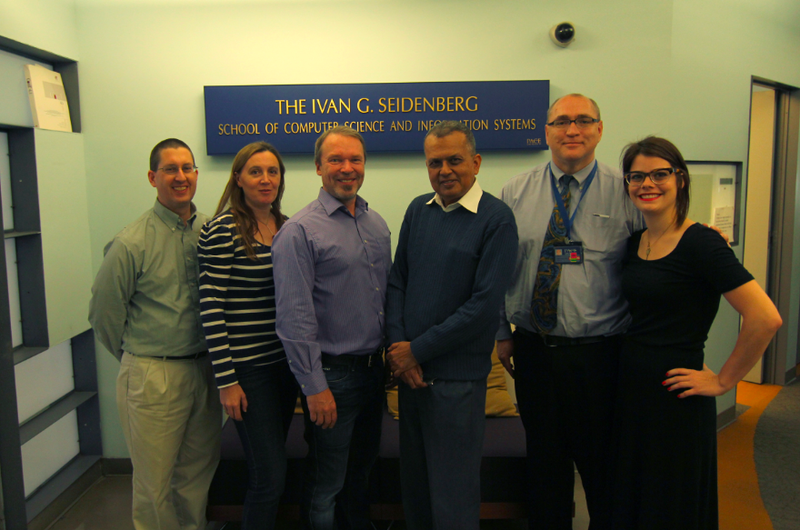 From left to right, Dr. Richard Kline, Dr. Christelle Scharff, Kalevi Ekman, Dean Amar Gupta, Dr. Jonathan Hill, and professor Bryn Haffey all stand together, prepared for Fall 2013. Quick note on classes that you may have been to that you’re already dreading. Our advice: drop them and substitute another. You have a few weeks to do this without penalty or before you miss too many hours of the class you may switch into. If you don’t like a professor or the syllabus makes the upcoming weeks seem dreary abort the mission. It’s not worth your time and effort to suffer through terrible classes and there are enough options available for you to switch without mussing your schedule. College is meant to be flexible and enjoyable. Some classes you will eventually have suffer through, but at least ease your pain by waiting until a decent professor comes along. In Seidenberg news, the Finns have struck again. If you haven’t met our partners from Aalto University (including Peter Tapio who was here during the Summer Scholars Experience), they’ve been around for the last few days and leave this evening, unfortunately. They will be back eventually, so catch them while they are around. They are all a wonderful resource available to learn about project development in many fields. The aforementioned workshop with Kalevi Ekman was a delightful afternoon. Photos from the event and a video that showcases Kalevi’s lessons on design will be available for viewing on Thursday. He himself is another one of our Finnish partners, also a head professor for the PDP (Product Development Project) program that Seidenberg takes part in. This program is an incredible opportunity for students and also gives students involved the chance to visit Aalto University in Helsinki, Finland. Lastly, don’t forget that Computing Society meets on Wednesdays and there will be free pizza, just so ya’ know.